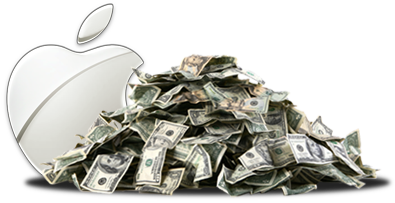 CUPERTINO, Californiaâ€”October 18, 2011â€”AppleÂ® today announced financial results for its fiscal 2011 fourth quarter ended September 24, 2011. The Company posted quarterly revenue of $28.27 billion and quarterly net profit of $6.62 billion, or $7.05 per diluted share. These results compare to revenue of $20.34 billion and net quarterly profit of $4.31 billion, or $4.64 per diluted share, in the year-ago quarter. Gross margin was 40.3 percent compared to 36.9 percent in the year-ago quarter. International sales accounted for 63 percent of the quarterâ€™s revenue. The Company sold 17.07 million iPhones in the quarter, representing 21 percent unit growth over the year-ago quarter. Apple sold 11.12 million iPads during the quarter, a 166 percent unit increase over the year-ago quarter. The Company sold 4.89 million Macs during the quarter, a 26 percent unit increase over the year-ago quarter. Apple sold 6.62 million iPods, a 27 percent unit decline from the year-ago quarter. Apple will provide live streaming of its Q4 2011 financial results conference call beginning at 2:00 p.m. PDT on October 18, 2011 at www.apple.com/quicktime/qtv/earningsq411. This webcast will also be available for replay for approximately two weeks thereafter.